Thanks for your memory. Ah yes, patience in retrospect… What is it with this obsession? I gathered windfall oak leaves yesterday and there are some late blooming flowers in the garden that I have my eye on. I am still timid but reading a lot. I’ve had a few flops and am wary of using iron and copper even in the most passive ways. I saw you on one of the FB ecoprint groups and smiled. I’ve not yet posted anything there. I totally understand your mother’s fascination. Once you start picking up autumn leaves it is impossible to stop. Each one is beautiful in a slightly different way. If only that beauty could be saved, but I guess its fleeting quality is part of what makes them so compelling. Your eco prints are a very good way of seeing and saving an aspect of their beauty that isn’t necessarily apparent even in their glory. Look at all the changes that have happened to you since last fall! Brava Patricia. hi. yes, i meant to make that point in the post–that i do understand my mother’s fascination and ability to find sublime beauty in the offerings from the trees. and sometimes i ask them–“which one of you wants to leave an indelible impression on cloth?” and that leads me to thinking about what it is we leave behind…and really, i think it may be nothing like what we imagined. thanks for your comments. Your Mom’s bejeweled cane looks like a magic wand and why not, she had the magic eye to gather nature’s jewels in the form of the many hued leaves that are given to us each season. 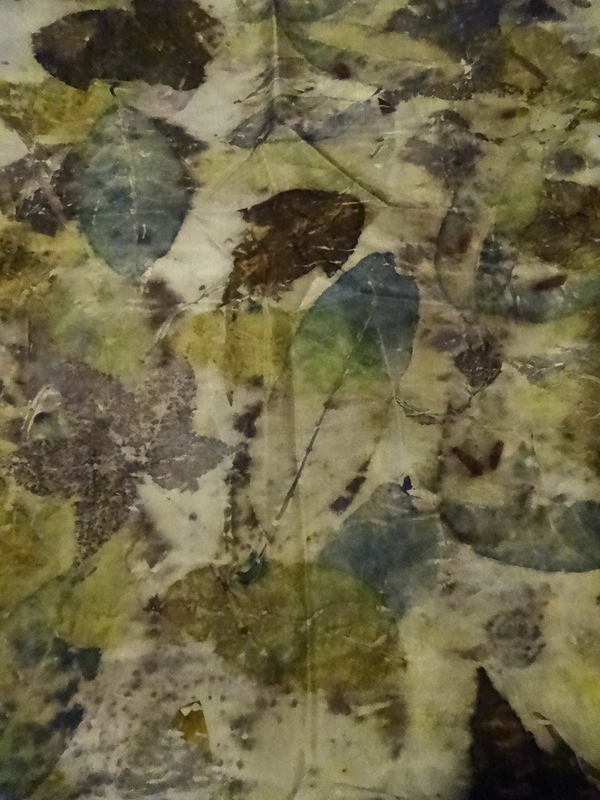 Sourwood, a tree I had not heard of gives such beautiful blue prints Patricia, the scarf is exquisite. . I get blue here from desert willow if I shock it with calcium carbonate. Gathering leaves is part of a seasonal ritual, the nesting urge that comes when we need to have some of nature around us as we head into the cold, quiet time. With your scarves, you have that with you every time you adorn yourself with your beautiful dye work. it was a magical instrument for her…and introduced a bit of playfulness around the movements of a woman who always had been so graceful and “coordinated.” she could laugh at herself–always a good think i think. i read somewhere that the Cherokee used its small branches for arrow shafts due to the straightness–and here there is a sourwood festival in early summer that features “sourwood honey”–early blossoms are spectacular and once you see them, you’ll never look at the tree with the same eyes. i’m finding that laying sourwood (blue) on top of sumac(sometimes yellow) yields an interesting green…at least with the last batch of leaves. 24 hours makes a huge difference in their chemistry so not sure what they might do today. thanks for sharing your own memories here. part of my process these days is simply giving myself a break…not remembering in terms of “should have” but rather simply “that is how it was, then.” maybe things would be the same if i had a re-do–but maybe not. anyway, i’m feeling clear that at any given point in time, i (we) simply do the best we can. and i’m tired of judging whether that was good enough. i think you probably understand what i’m trying to say. and as Cynthia says, gentle day to you. what a magical cane wand! perhaps the cooler weather & change of season is affecting the colour ? 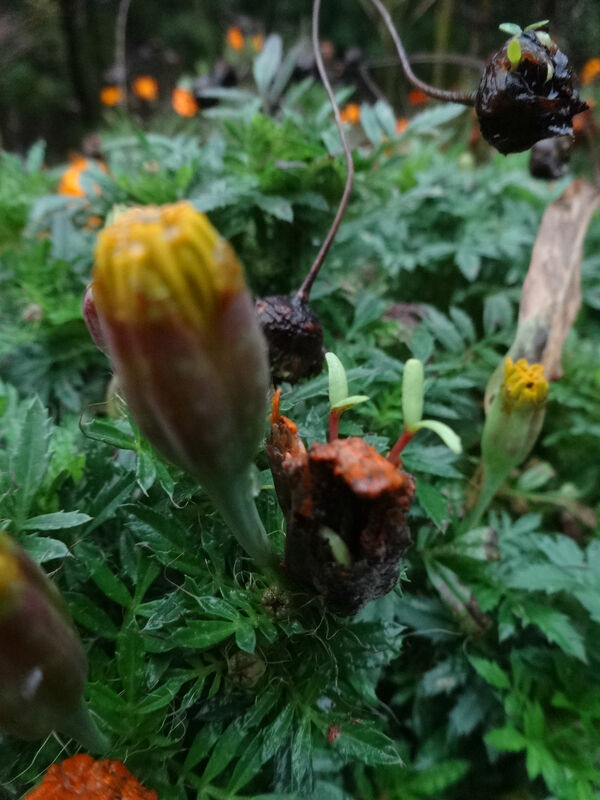 the plant material is gathered…???? Mo and Grace–it ALL matters–weather, location on the tree–orientation to the sun–i think this is one thing i love about it–capturing one moment in the life of the leaf that will not happen again and cannot be replicated. does this make any sense? to me it seems profound. someone else might thing me nuts–because i actually almost audition the leaves–ask for their willingness to participate. and some i have to put back. i love the cane that you made for your mother..since i spent part of this year using..a hiking stick..cleverly provided by nieces who knew how hard i was taken being dependent..and it actually was so well loved by the people at pt..so many people hate suddenly being that person…that external person who needs all kinds of help…but who is still quite whole and feeling not at all old or needy inside..
i remember my mom going though this and how i promised myself..and probably anybody within hearing distance..that if i ever needed help ..i would ask..i would accept gracefully..and i really have tried to do that..but i am glad that i beribboned and decorated things for my mama..and i so applaud you for what you did for yours..oh sometimes perspective..besides being everything..really bites..
the simple pleasures, is what I think. nicer than : obsessive behavior. 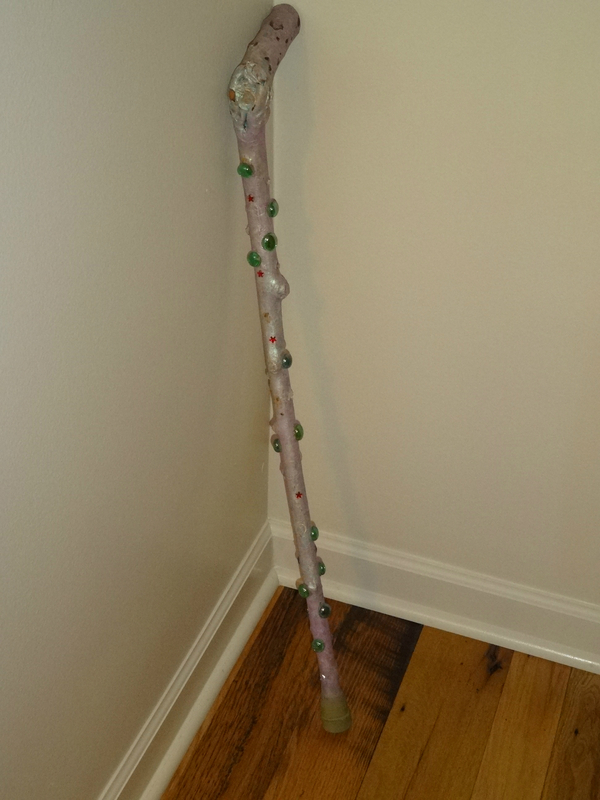 I enjoyed the memory of your Mom and that cane… agree with others who see it as magical! Hi Patricia. How are things going?